- I'm a child of God and a Christ-follower first. I'm a husband, father and friend second. The fact that I'm also a proud American is, at the very best, third on the list. - God's kingdom is really the kingdom of my citizenship. - Ultimately my trust, security, future and everything else I hold dear is not protected by the United states or the person charged to lead us. - Obama isn't going to bring about "Change we can believe in" any more than McCain is going to be a "maverick". That's all just a bunch of campaign hype. They're both politicians who will forget about promises made and positions staked out shortly after entering office. Partisanship, bickering, finger-pointing and gridlock will prevail under our new leader just as it always has. I think this was more for my own "therapy" than anything else, but it feels good to remind myself of a few things. We shot this podcast over a month ago, but some "technical difficulties" kept it from being posted until this week. Phil Shinners, the junior high pastor at Mariners Church, joins in the discussion. I believe early bird registration ends on Friday! 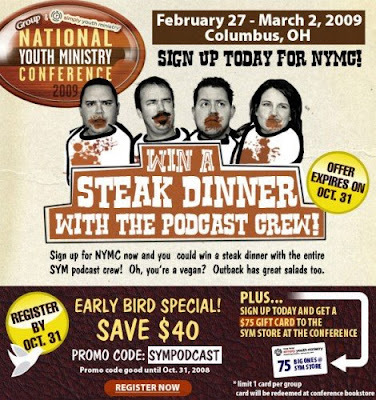 Group's National Youth Ministry Conference is entering its third year and this year is shaping up to be its best yet. - We had an incredible, but really long weekend. On Friday night we hosted our first "7th Grade Retreat" for 7th grade small groups. It was short, sweet and simple. The event started at 7:00 p.m. and went until noon on Saturday. - After the retreat, we took 150 students to High School Musical 3. - Then, we ran four youth services that included our annual wrap up to Choctober...THE MUDSLIDE (a massive slip n slide made up mostly of soap and water with a little bit of chocolate syrup added for effect). Historically, we've done this event down the center isle of our junior high room, but this year we moved it outside and we built a ramp that ran down our amphitheater stairs which turned out to be super fun. The video was taken after church when one of our adult leaders got a massive running start and caught some serious air pretty much missing the entire ramp! - I spent much of my day yesterday doing some very basic maintenance on our dirt bikes. Basic maintenance for most people, that is, but for me it took several hours! - Today actually feels a bit slow which is nice. We are kicking of a new series this weekend called "The Red Stuff" that will focus on the words of Jesus (red letters in the bible...). I'm in the process of trying to categorize Jesus' teachings in some junior high friendly terms. Okay, it's not really a "fest"... just a few links you may find interesting. Today in a meeting, we somehow went down a very fun rabbit trail. We started recalling all the traditions, sayings, activities, approaches to ministry etc. from the churches we grew up in and even from the youth ministries we've been a part of. Here are just a few....add your own to the list. - Singing "In The Round"
- Extending the "Right Hand of Fellowship" to new church members. - Being driven around in the back of the youth pastor's pick up truck while Christmas caroling. - Hearing the phrase "backsliding" as part of our vernacular. - Showing students "physical affection" in the form of swirlees, wedgies, noogies, charlie horses, pink bellies etc. - This past weekend we wrapped up our six-week series, The Face of Love. We rarely do such long series, but it was part of a church-wide emphasis. Two weeks ago, we started having a Friday morning "Talk Through" of our weekend program because it felt like we were showing up on Saturday without a good enough grasp on what we were doing. So far, the results have been tremendous and well worth the extra effort. - I feel really tired. Since the opening of our building in June, our team has been running 110% all the time. But the end of October looks like it will bring a little bit of down time for all of us. - Big game tonight! A Broncos win will put them in the driver's seat of the AFC West. - My wife and I have been meaning to for years, and today....at the deadline...we officially switched our voting registration to "Decline to State", which puts us as independents. I feel like I'm betraying my party....and my parents! - Speaking of parents: I feel like I was a crappy one this weekend. I wasn't around much, I over-reacted to a situation with Cole, and when I was around, I choose to huddle up and watch too much football. Unlike me, and probably a sign of my fatigue. - Heading out for a short date day with Rachel. Smiles all around. Nobody has ever accused me of being a deep thinker, and I'm surprisingly okay with that. I'm a pragmatist through and through....with all the good and bad that comes with it. After over 20 years of hands-on youth ministry combined with undergraduate and graduate education in the field mixed with extensive reading and writing on the topic combined with attending and teaching countless seminars and workshops dealing with youth ministry, I think I have come up with my own manifesto, of sorts (shout out to Marko...). This is in no way meant to be a response to Marko's book or to Chap Clark's books or to Doug Fields' books or to Kara Powell's books or to Mark Yaconelli's books or to my own books or to.....well you get the point...there are a LOT of youth ministry books with a lot of incredible, important, information about how we can be better at what we are called to do. I'm a proponent of being a life-long learner, and I think the more reading and training and sharpening we can get, the better we become. But with all that also comes a muddying of the waters. Some of the most basic principles in youth ministry can get lost. So sometimes a little simple, pragmatic thinking can be a good thing. So, my pragmatic youth ministry manifesto is this: Build a team of caring, Christ-following adults who like teenagers, then do whatever seems to work best in your unique setting to assist those adults in building relationships with your students as they walk with them through their journey of faith. That would be a pretty short book, I suppose. Youth Ministry 3.0 Update: Apparently the book won't be available on Amazon or through any other online or physical vendor until early next year. So until then the only place to get a copy is at one of the two remaining NYWC conventions. If you aren't going, find somebody who is and ask them to buy you a copy. On the flight home from Sacramento yesterday I devoured Mark Ostreicher's new book, "Youth Ministry 3.0". If you work with students, you simply must read this book. I say this not because I agree with everything Mark writes (in fact there is much in the book I don't agree with) but because it is a book that forces you to think about how you are doing ministry and to wonder if there might be a better approach to traditional youth ministry than doing it traditionally (my paraphrase, not his words). Youth Ministry 3.0 encouraged me, frustrated me, challenged me and prodded me, and I hope it will do the same to you! Help Us Create The New SJH Catalog! The crew is working on a brand Simply Junior High catalog and could use your help. If you have pictures of your junior high ministry in action (serious pictures, goofy pictures of kids, pictures of adults interacting with students etc. ), we want to put them in the catalog. - Overall, the conference has been a great one. From my perspective it feels like there were lots and lots of new topics offered in seminars, the general sessions were solid and as always it was a weekend jam packed with coffees and meals with old and new friends. - I think my only complaint (complaint feels like way too harsh a word...) is the length of the general sessions that were often THREE hours long. I find it really, really hard to stay put for that long. I typically found myself slipping in later and later each session. Last night I snuck in just in time to hear Tony Campolo. The general sessions have always been long, but for some reason they felt longer than usual this year. - Tony Campolo: As always one of my favorite speakers because he says a bunch of stuff I don't totally agree with, and forces me to re-think my theology, my world view and my methods of living out my faith in Christ. - The exhibit hall was, as usual, a strange mix of publishers, camps, mission organizations, fund raising opportunities, universities etc. However, this year there seemed to be more than the usual amount of just plain weirdness. * Hume Lake's booth was an opportunity to ride a mechanical unicorn while people in Elves costumes cheered you on and blew soap bubbles all around you. Your prize was a fake mustache. It was like an acid trip meets strawberry shortcake meets cotton candy meets that candy mountain cartoon on youtube. * There was a guy dressed up in a vampire costume promoting some sort of "Bite" ministry. * Another guy had a huge snake around his neck. - I felt like the seminars I taught were average. My first one was a 2.5 hour introduction to middle school ministry. I tag-teamed with my friend April Diaz who is a super sharp young youth minister. It was well received but I'm realizing I'm not a great person to teach alongside because I'm long winded, go off on tangents, get out of order etc. and I'm sure it was frustrating for April at times. The second seminar was on the topic of ministering to the parents of middle shoolers. It is a subject I've never formally taught on and an area in our ministry that has lots and lots of holes in it, so I felt somewhat insecure in presenting the seminar, but hopefully it provided some insight and encouragement. - I haven't bought anything yet, so I think it's time to make a final pass through the YS bookstore. - At lunch we ordered what, without doubt, were the tartest, tangiest, most bitter glasses of Lime aide ever put to lips. Delicious. - During the opening session Mark Oestriecher said what he always says: "relax, eat a good meal, make new friends, skip sessions...do what you want to do to make the weekend a great one for yourself". I've heard that for years, but this year it really sounded good. I think I'm more tired than I realize and will probably sleep, read and relax at least as much as I do "conference stuff". - In that spirit, I snuck out with some buddies to see Body of Lies. Good flick. - I'm posting from a little internet cafe smack dab in the middle of the meeting hall and worship is in full swing. Feels a little awkward to be online while 3,000 others are engaging in worship (although there are three other people online next to me) so I think it's time to sign off. - I'm excited about NYWC in Sacramento this weekend. It is always a great time of connecting with old ministry friends and meeting new ones. I mentioned trying to grab a meal with frequenters of this blog, but my meals are all booked! But if we see each other in the hallways, be sure to say hello. - Speakers are no longer allowed to promote their books, resources, ministries etc. in their workshops (a good policy, I happen to think...) so be sure to drop by the simply youth ministry store in the exhibit hall to check out all the newest junior high resources. - Don't go see American Carol. Even if you agree with the politics in the film, you will be shocked at how appallingly un-funny and offensive it is. - Disney sent my family invitations the the High School Musical 3 premiere in LA next week. I'm not sure who's more excited my kids or their parents! They are excited to see the movie and the stars, I'm excited to walk the red carpet and be mistaken for a star...an aging, balding star. I'm trying to create a list of helpful resources for parents of young teens. Websites, books, newsletters etc. If you have a favorite, would you mind sharing it? Two New Small Group Resources! On the hunt for small group curriculum? I'm super excited about two brand new small group resources created specifically for junior highers. Bible Stuff Vol. 2 video curriculum contains five video-driven lessons. Each video sets the small group leader up for some really great discussion with their students. Bible Stuff Vol. 2 focuses on God's story. Active Bible Studies contains 20 hands-on, experience-driven small group lessons. - Weekend at Church was really fun and really busy. Started it off Friday by going to a high school football game, then popping into our high school ministry's '5th Quarter' which was really fun. On Saturday I went to our 4:30 JH service for our 4th week of "Face of Love" and then skipped our 6:30 service to attend Mariners Church for the grand opening of their new student center. On Sunday I attended our 9:00 a.m. JH service then hustled over to our Irvine campus to be a part of their 11:00 a.m. youth program. Whew....!! - In addition, each year our JH ministry 'cancels' October and replaces it with CHOCTOBER...a month of chocolate games, chocolate prizes etc. Week one was a huge success. - Pastor Rick took a whole crew of us to see "American Carol" last night. Fun idea and really great to be out with him and a bunch of the staff...but TERRIBLE movie. The best way to describe it would be a wacky "Airplane" type movie. But in order to even have a chance at laughing at the gags one has to be really, really well versed in the Left vs. Right politics of our times. That mixed with the fact that it just wasn't funny made for a rough ride. - Interesting that it seemed like the media was united in calling for the "bail out" and now only a couple days later they are united in questioning if it was a good idea. I once heard that much of the media exists to first build people and stories up and then tear them down. This feels like an example of that. - Does anybody watch "The Unit"? It is quickly becoming my favorite show. - My wife has been laid up for over two weeks and today is her first real day up and around. She took one of the kids to school which made our morning much less hectic. - Spending date day with Rachel by having breakfast together then taking my dad to the doctor followed by prepping for my Youth Specialties workshops. Not sure where the date in date day went! If you are interested in downloading a free HSM3 Bible study/discussion guide to use with your students, you can get that here. If you three will send your mailing address to me at Kurtj@saddleback.net, we will have your prizes mailed out early next week. Congratulations.